prompt delivery and courtesy in a professional manner. and I shall do my best for you. It arrived yesterday and is beautiful. and framed for my husband's 50th birthday. which your company made for me. delighted with the gift of their coats of arms on a double plaque. our family's summer place in Galway, New York. 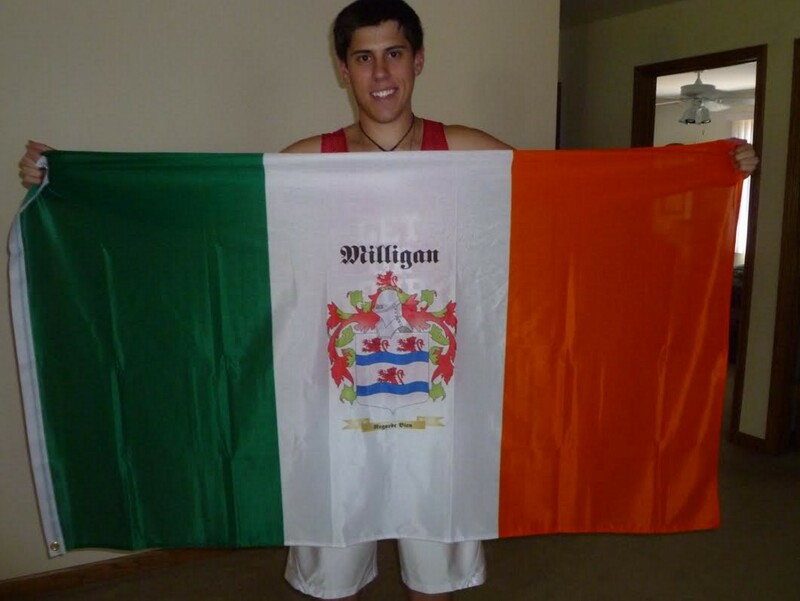 My Irish flag with the custom Coat-of-Arms arrived today. It is outstanding! Thank You very much! members will be very pleased when they receive them. at them, may God rest her soul. I received the three family crests I recently ordered in the mail today. They are beautiful and exceed my already high expectations. business with you in the future. It came today!!! I am so very pleased with the quality!!! 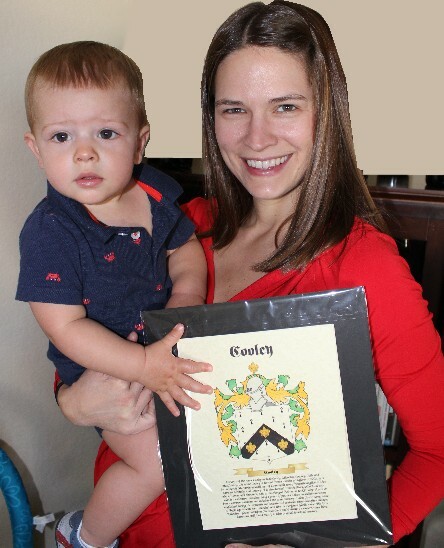 My son was absolutely pleased with the family crest print! best gift anyone could ever give or receive for the money! and were very pleased with our purchase. within 5 min about our delivery question. We will recommend you to everyone we know. Thank you Michael. pride and joy for my retirement days to come. would arrive in time for St. Patrick's day. More photos to follow. for the amazing flag and also for the family print! thank you! It is great and I can't wait to hang it up for all to see! our flagpoles, with the New Zealand flag on the other. something else to replace it. And now we have it. 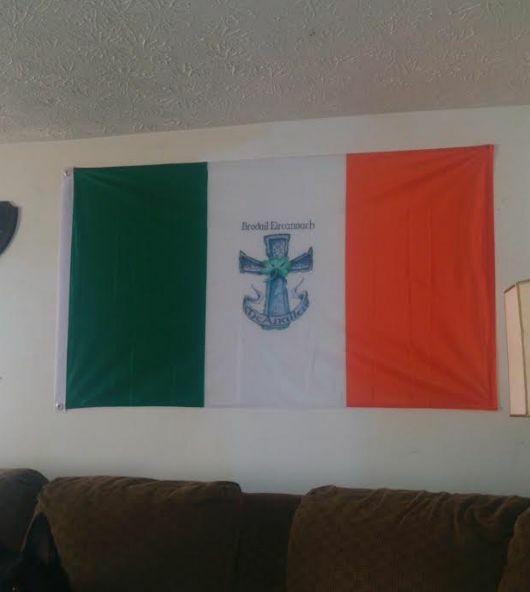 flag, which is my Irish connection through my great-great-grandfather. I may be in touch again soon!! own McDonagh / Kelly items. away until I got something near enough to suitable.!! I have sent them in their original size - I hope that's ok. Thanks again for your prompt delivery of our flag. Thanks for your help with everything and have a wonderful day. - so we're all set and excited about tomorrow. 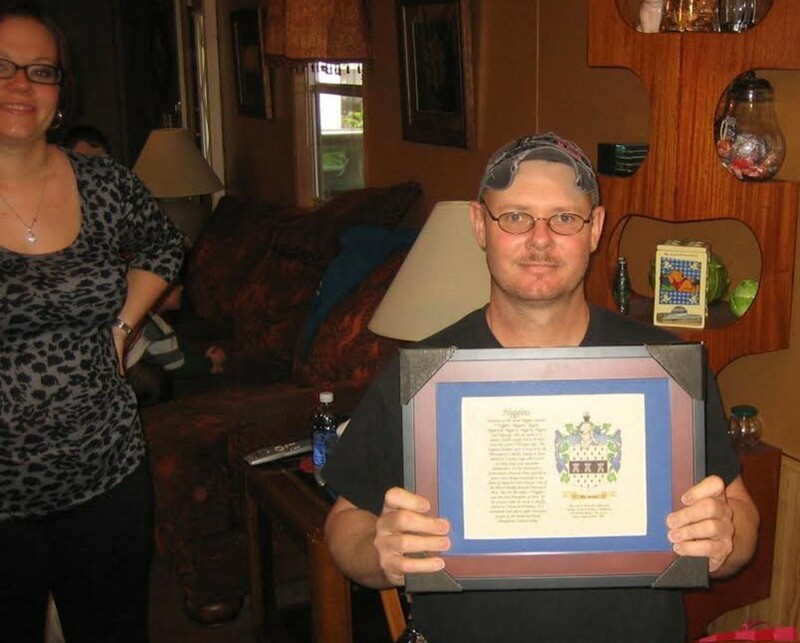 Paul Stuewer, a New York State Trooper, for his birthday. I, too, am apprehensive about ordering merchandize on the internet. I just wanted to let you know that we received the prints today. our families are going to love them! 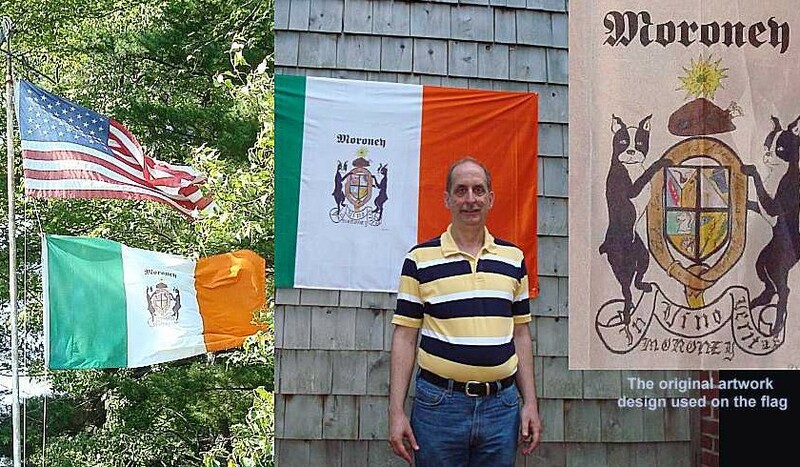 By the way, I am very, very proud of my Irish heritage! 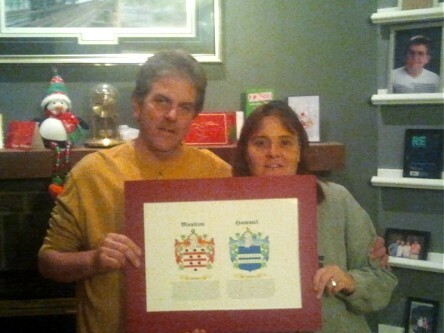 Hi Michael, we love our family crest print it came out great. and I know they will love it as much as we do thank you so much. I HOPE THIS GOES THROUGH MICHAEL. 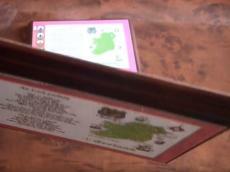 THE SERVICE FROM  IRISH NATIONS AND THE PRODUCT WAS BEYOND EXPECTATION. I WOULD HIGHLY RECOMMEND YOUR COMPANY  TO ANYONE. I HOPE EVERYONE THAT READS THE E-MAIL WILL FEEL SECURE IN ORDERING FROM YOU. Michael:  attached are pictures of my son, Brandon, and my beautiful new daughter-in-law, Juliet. They were absolutely thrilled with beauty, details and workmanship of the double plaque. 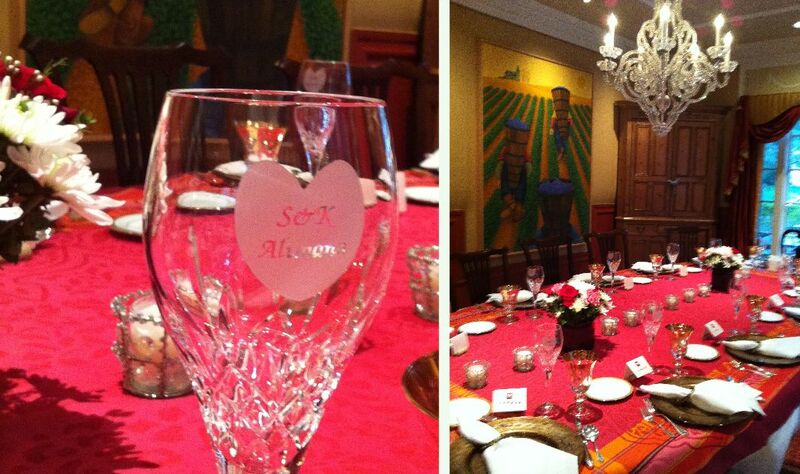 What a memorable wedding gift to hand down through generations. I am quite sure you will be hearing from us (and our friends and family) again...Many, many thanks again. Thank you so much for your prompt and friendly service. 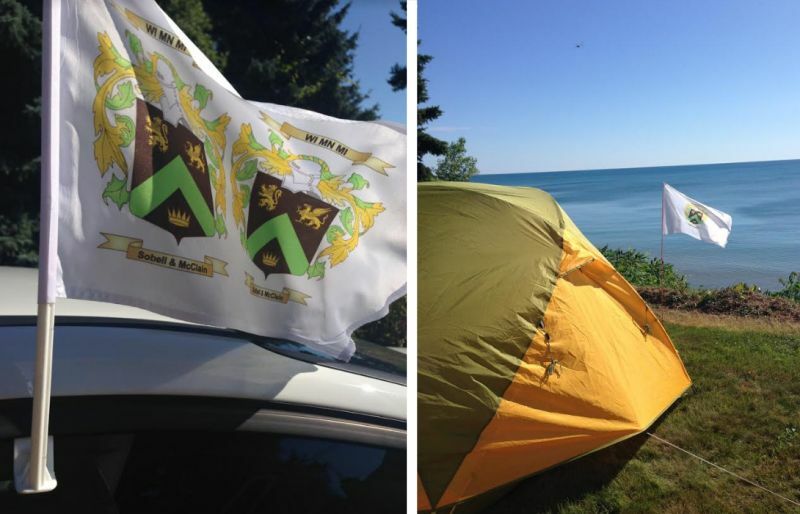 The Kelly Klan loved the Kelly flag and Irish flag, which flew from the peaks of our festival tent. Over 100 Kelly Klan family spent the week of August 3-10, 2013 socializing and attending many planned events, including a Family Variety Show, Casino Night, Beach Barbeque, Gala Dinner, Hikes, Bingo, Storytime with the two matriarchs, and Family Media night, including photos from four generations of Kellys. Thanks for your great work and patience. It is wonderful. "evilsizer" surname file. So if my cousins wish to order they can just go to your site to do that? And the prints would automatically have the description of the crest? 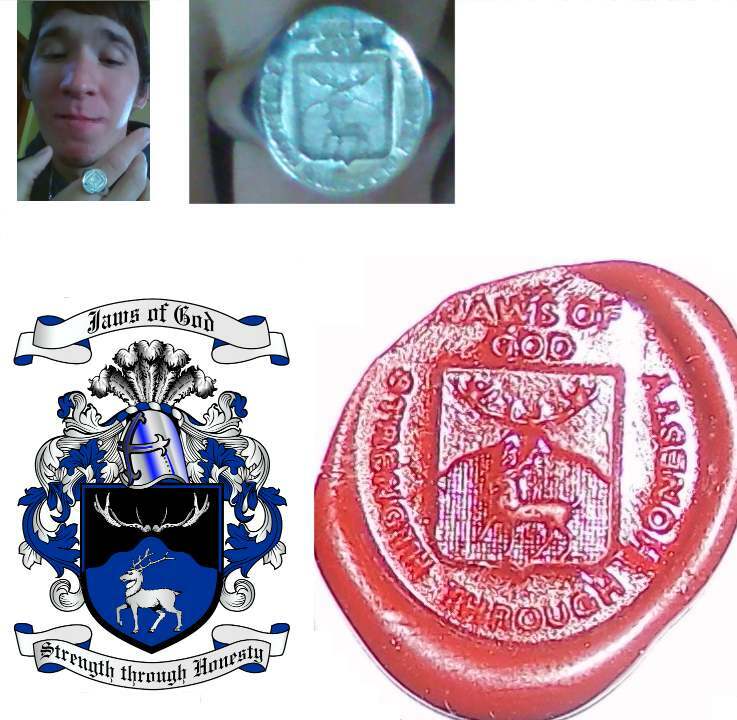 received from your company of the two Family Crests. lessons from you as to how to treat a customer. anything from your company, please don't. 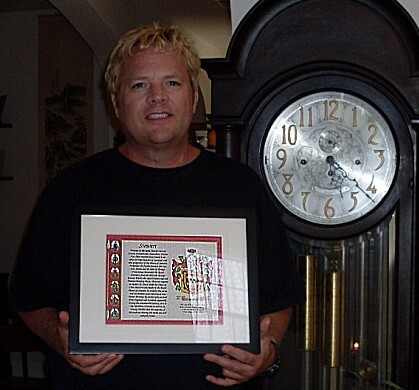 Today we received our McDonnell  plaque (it�s a house warming gift for special friends)and we wanted you to know how pleased we are with the quality  of your work. I just wanted to thank you for my coat of arms plaque. It arrived with plenty of time to spare and I think my husband will be just as happy with it as I am - it's beautiful! Thank you very much. 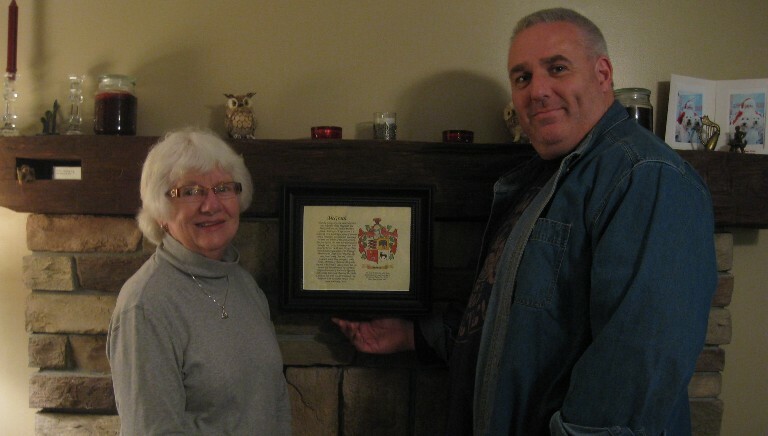 I just gave my husband his family crest plaque today. It's his 50th. He was absolutely thrilled with it and loved the copper finish. It is already hanging up in pride of place at the front entry of our house. 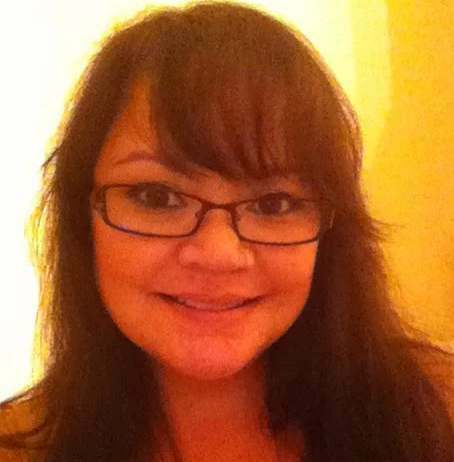 Here is a photo for you to use on your website. You are welcome to use my email message too. Thanks once again for our plaque. 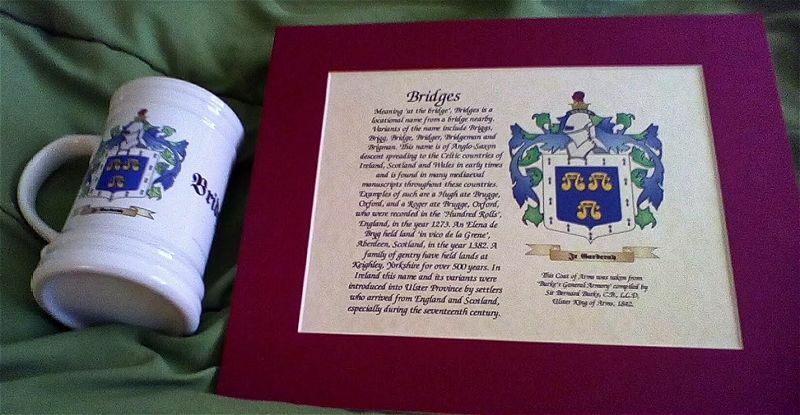 Here the promised pictures of our wedding with the familycrest gift. My wife was very please and surprised with my gift. So again many thanks from us. Irishnation.com was a pleasure to deal with. I placed my order (of a double family crest) and received my delivery within three days, which was fantastic! I was impressed with the detail and finish of the product which made a lovely wedding gift. Most of all, I was delighted with the personal customer care on the other end of the line!" Sure, I don't mind a bit. I'll work on getting pictures this week. I'm one of those wary people, especially since I was burned once. However, while the feedbacks on various sites ease the fear, it's the personal emails that really sealed it for me. I have never gotten such focused attention on an order, domestic or foreign. Even the stores down the road haven't been as easy or satisfying to shop. I know you'll here a complaint in a heartbeat, and often customers are lax in the positive feedback. I prefer to focus on the good in life. I will send you pictures soon. Enjoy your day! I received the package Friday afternoon and the items are fabulous! It travelled quickly. Thank you so much for all the care you've given this order. I'm certain I will shop your site again soon. Thank you so very much for getting our order ready and here in time for our parents' anniversary! It's absolutely stunning. They opened it in front of all our family and friends, at their surprise party and everyone was so impressed! Many thanks to you and your incredible team for getting it to us on such short notice (it even arrived a little early!) and thank you for the lovely screen savers as well. My parents love them. My siblings and I are very grateful to you! 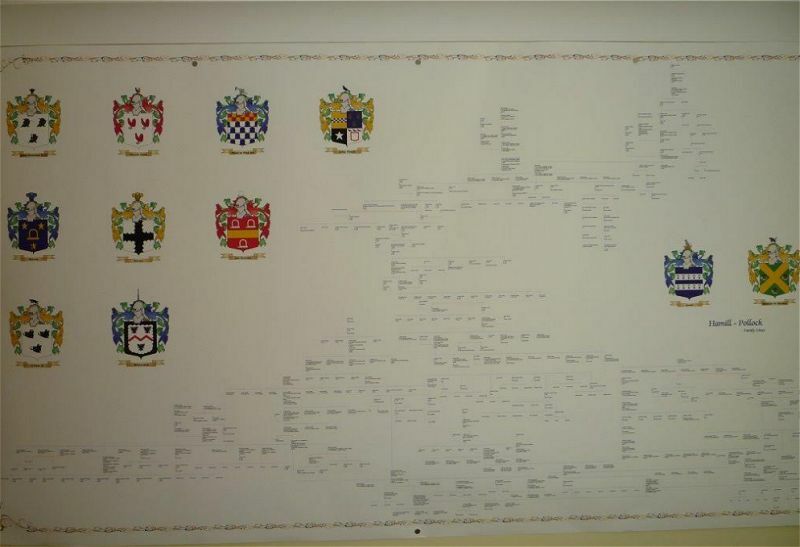 Below is a photo of our lovely family crests. We are hoping to mount it over our mantle!! I received the plaque today. Beautiful job. Thanks a lot. My cousin was soooo jealous of the Sheehan cufflinks I gave my husband, I had to send him a pair. Please note this order will be delivered to Australia, not USA. I would love to leave a comment on your website. 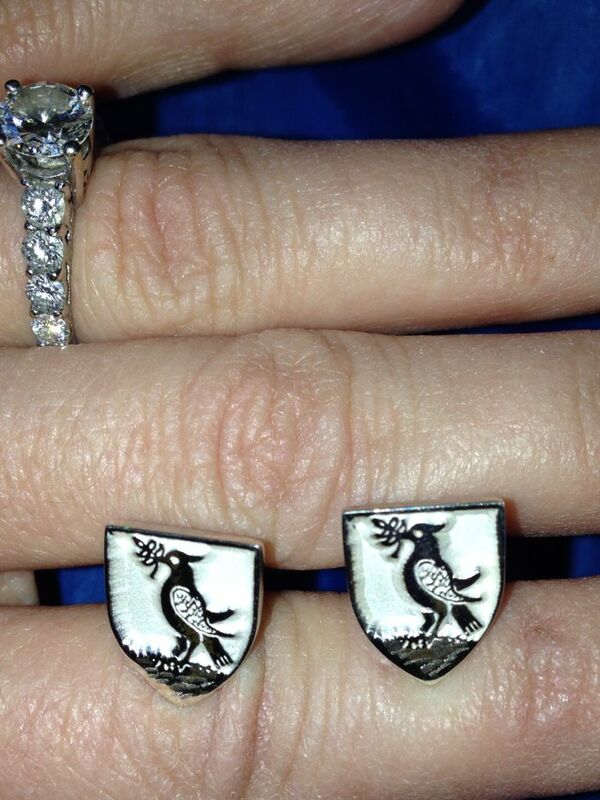 I had very high expectations for the sterling silver Sheehan family crest cuff links I ordered. My greatest hopes were exceeded by the quality workmanship, superior customer service, and the quick shipping to NY. I gave the cufflinks to my husband, as a meaningful, heartfelt gesture. I took his last name when we married, and so I gave him mine. My cousin very very jealous, so I sent him a pair of the colorful crest links. My husband became a it jealous, since he thought that the those would be a little more casual. And so I ordered another pair. And I am sure I will be ordering more. Please, do not have any hesitation about doing business with these fine people. We just recieved our Irish Cottage Sign. I just love it ! It's awesome! Its everything I expected & more. Thank you for being so patient. We hung it staight away by the front door. Our neighbors will love it. We will be a returning customer. 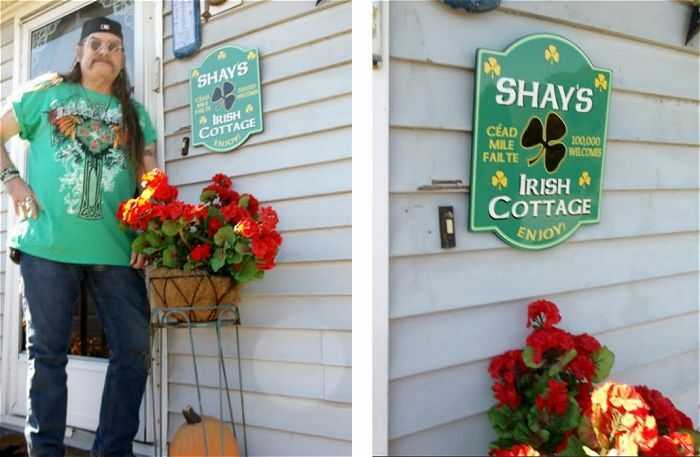 Here are a few pictures of our Irish Cottage House Sign & my husband John Shay standing next to it. I hope they are of good enough quality that you can use them in some way for your website. I am not a great photographer, but I hope they are acceptable. 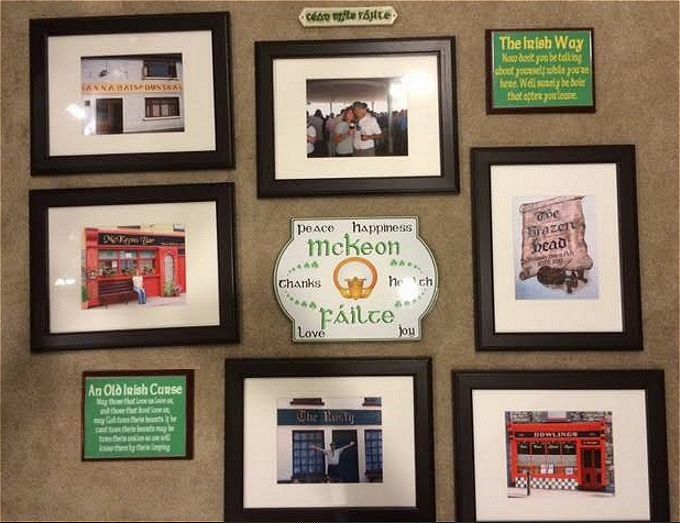 We really love our sign & to show our pride in our Irish heritage! 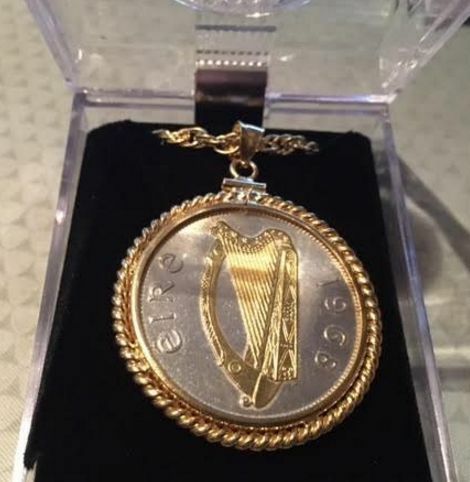 We are so pleased with our purchase and there are so many people here in the US with Irish ancestry and well pleased to show it off ! I hope they use your webstore to do so. I've only just realised that I didn't send you the picture of me with the plaque and flag... I'm really sorry about that! Attached is the photo of me with my partner with both the flag and plaque. I'd just like to also say that I am extremely pleased with the craftsmanship and detail of the plaque. The delivery time was great, too! Very fast. The plaque is on display in our dining room, and the flag in the lounge room. And I'll definitely be buying from you again! Thank you michael for a lovely plaque. It arived yesterday afternoon. The wife was and still is -over the moon- with it. It is now hanging in the hallway for all to see when they come to the house. 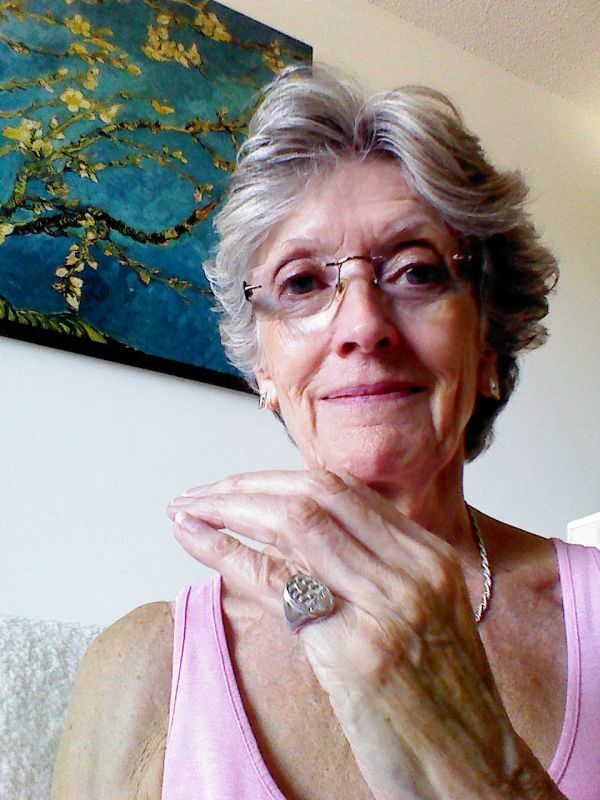 "My Online experience from Irish Nation was nothing short of spectacular. From start to finish their customer service and quality were second to none. I would not have any reservations ordering from them again. 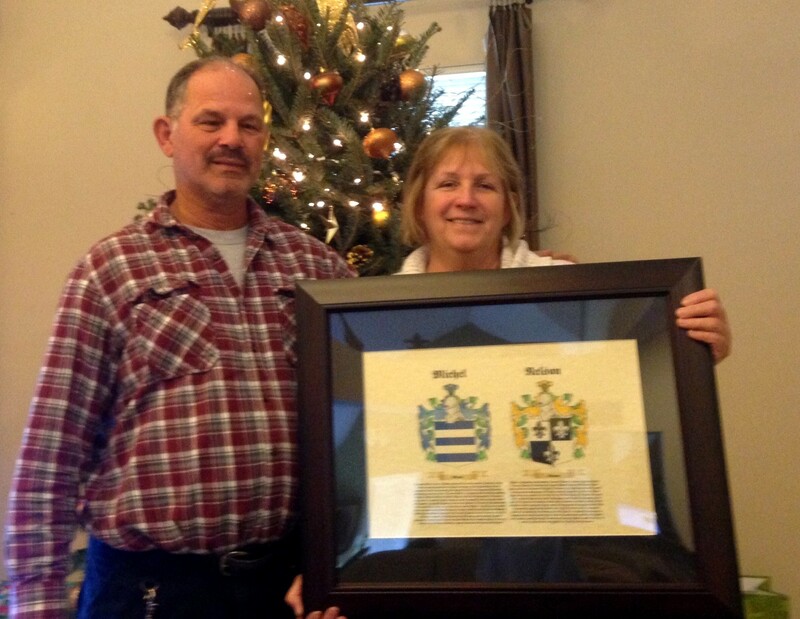 The hand painted family crest was a beautiful heirloom quality piece my family and I will enjoy for years to come. Five Stars!" As promised picture attached and more formal testimonial below for your use. I spent quite some time searching for the perfect 7 year wedding anniversary gift for my wife. 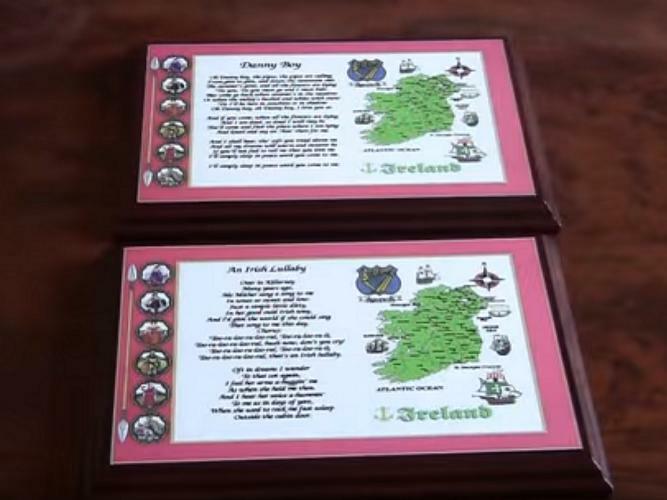 I found irishnation and saw the crests they offered I thought it was too good to be true. My wife is very much into family heritage and history. At first, I was hesitant to place an order being on the internet and all, but I decided to give it a shot. I have to say I have been thoroughly impressed and pleased with the service. The communication was awesome and they even provided samples and asked questions prior to making the crests to ensure I would be happy with the item once made! You do not find service like this very often these days. Everything came as promised and described and the workmanship exceeded my expectations. My wife absolutely loved it, and I was so pleased with everything that I wanted to let everyone know these folks are top notch. Our youngest daughter even loves them as you can see in the picture. One day they will be given to her and hopefully she will pass them along to her children. I received the flags today and am thrilled with them and your amazing customer service! 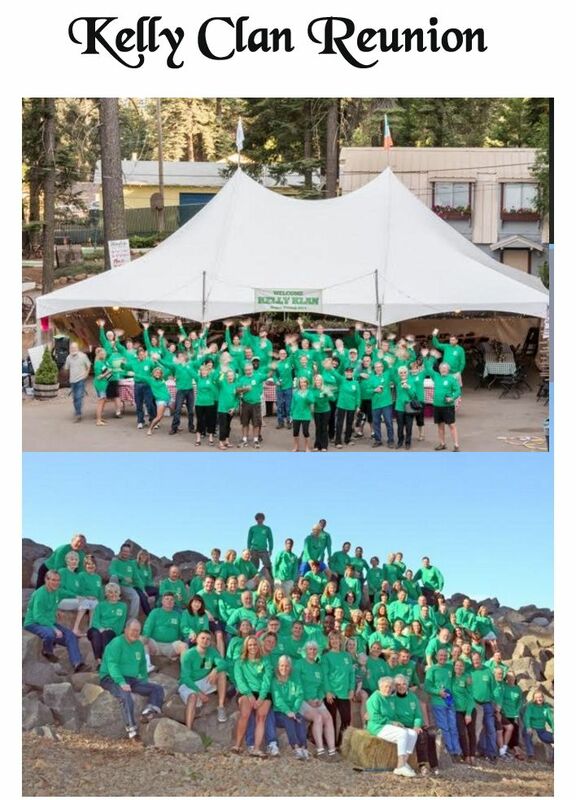 I can't wait to join our family get together and will let them all know where to find you! Thank you again for the amazing service and the flags are perfect! Please disregard  my previous  text as the flag arrived in the mail today       (  Sat ). Flag looks great. The Crests have arrived and they are magnificent. My Dad was extremely happy getting his. He had wanted one for ages. delivering a first class product. we come from a long line of Paynes from Leicestershire in England. 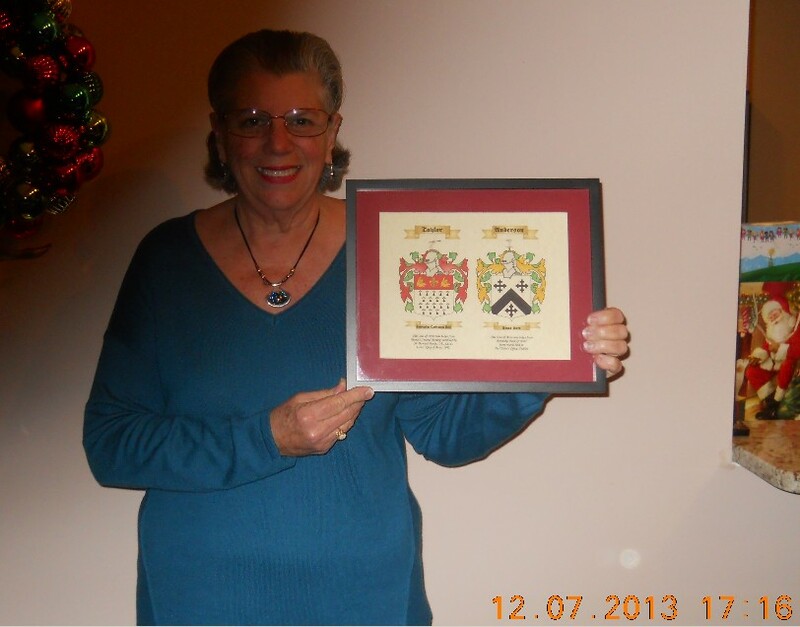 The arrival of the crests were a perfect complement for our journey into our families past. 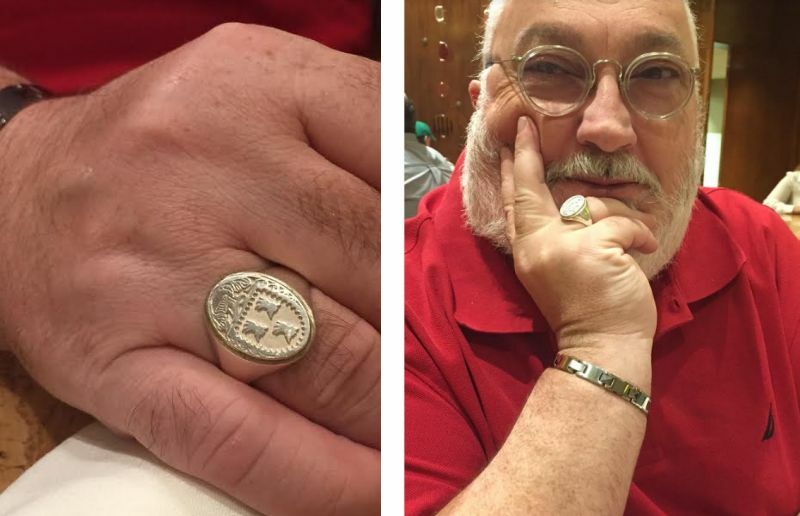 My Dad, Barry, was extremely happy getting his. He said that he had wanted one for ages. We are all blown away by the high quality of the crest. Thanks very much for delivering a first class product. 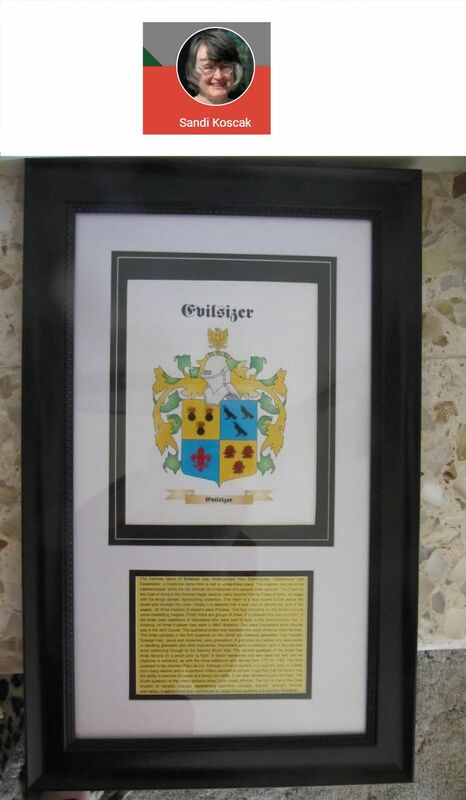 I bought this framed double family crest from you as an anniversary gift to my husband. He just loves it and I was very impressed with the craftsmanship and quality. I would also like to thank you for your prompt reply to my emails, this was reassuring that I was dealing with a professional company. I will be recommending you to our friends and family. My flag arrived today and to say I love it is an understatement,it is perfect,thank you do much,one very happy Conway lass here. Nicolas Cage, January Jones and Guy Pearse. the family crest for his name: Marsh. Got my Flags today & look great. Michael, just wanted to let you know I received the coin chain. I posted this picture of it on Facebook and so far 98 likes and a good many comments. Hello Michael, I am very satisfied with my purchase. I will plan to use irishnation again someday. wonderful gift for my husband as I hoped it would. The quality and colors are outstanding. I received the Flatley family plaque today!! it. I would like to order another one! Best wishes for happy holiday season. very impressed by the high standard of both. your products are great bargains. Just wanted to say 'Thank you' for my order. side of the ocean and most of them are my family! I will definitely revisit the site. me while ordering my family Coat of Arms print. the first time I was actually able to find it. referring friends and family to your web-site. 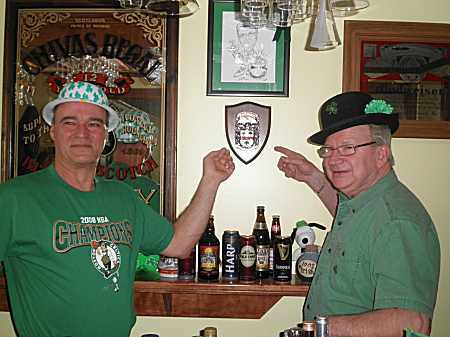 having over 30 O'Dowd's for St. Patrick's day. gave her the ring for her graduation, she was pleased. We both wear them now. report was regarding legends and traditions in Ireland. One of the traditions is the Claddagh Ring. part of this with us!! sure my wife will be very pleased with it. visit to the Emerald Isle. I am so happy! I received it on Saturday and was very impressed. here, my faith restored and a very satisfied customer. more than I had hoped for, by far. call on me. I am at your service. And thank you so much for your extra effort. own such a great item! where my husband still has family (Galway)! christmas present before and I have you all to thank. arrived a couple of weeks ago and it looks great. for the care you took in the shipping. company. I look forward to shopping again soon. Thanks again and God bless!! I can't even tell you how pleased I am with my order!! I look forward to shopping at your store again. My dad kept the envelope! ordering a coat of arms and legacy statement from you later this fall. I will contact you accordingly. do you mind if we use your email messsage at our web site? of the family is in for a surprise. weeks after ordering! Outstanding job on the flag! God rest his soul, is smiling from above. Flag you sent me for my Father's Christmas Present. for the vouture it will come in handy for next time. for the job well done,the coat of arms is beautiful!!!!! I did receive the cufflinks on Friday. They are beautiful. wedding. We gave our son the cufflinks at dinner. My son send me a note last night before he went to sleep. you getting them done and to me in such a timely way. We are all very satisfied. I just wanted to tell you how much I love it! thank you so much, I was very impressed with the quality. Hi! I just wanted to touch base with Mike (I think). I wanted to send out a huge THANKS. the envelope and read the history of the Gilmore name. were filled with tears. He was very happy indeed! So, I wanted to say 'thank-you"'. - which we received today. We are absolutely delighted with them. it's just great. It's for my best friend and he'll love it. much faster than I expected, too. Thanks for your time and take care, all. Yes of course you may use this on your website. You company deserves the highest recomendation! Many thanks again, Eve- one very satisfied customer! May i say the order/ring has turned up as promised and on time. for attending my worried and painful emails. The ring is even more beautiful than on the web site. We are so happy. Your company will be mentioned every time anyone asks about our ring. Many thanks again. Eve Merta. I ordered for the name of Guilfoyle. I was very impressed with the rich detail and craftsmanship. Please disregard my previous message. My package arrived when I got home today. displayed in my family room at home. Thank you so much for providing this product. and pass on through the generations. It (the tie clip) came in plenty of time and it's fabulous! appreciate all your help! Thank you so much! I have received the package, and the rings are more than beautiful. I cried when I saw them, and again when I presented my husband with his. 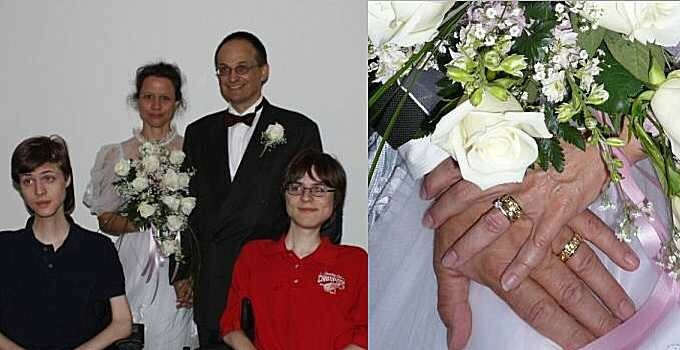 his father is getting remarried, so maybe a ring for the bride and groom. I am so proud of it, and the flag as well. trouble put into it, I really do appreciate it. see the expression on my cousins' faces when they open their gift! Thank you again. I am so pleased with the plaque! Post Script: The beautiful plaque was so appreciated! My cousin John has it in a place of honor in his home. Thanks again! Wanted to let you know that my wife loved the earrings. The quality and workmanship are excellent. and the wonderful products you have available. I would be honored to have my comments included on your website. Again, thank you for an excellent product. Thank you to you and to Irishnation.com!!! 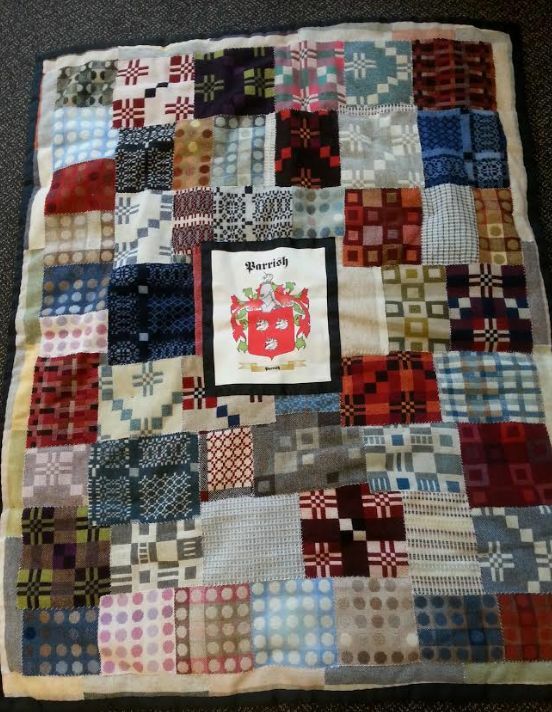 Thank you so much for an absolutely beautiful and perfectly unique gift for our newest Grandchild! When she was born, I was thrilled that her first name was a family heirloom last name from my Irish side of the family - Quinn! 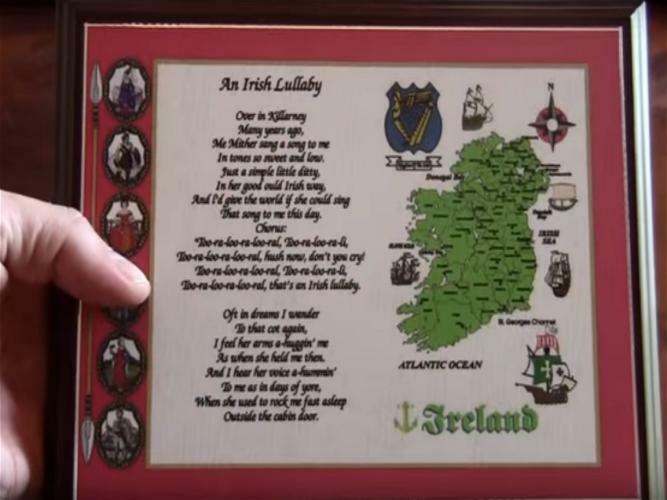 Thanks to you, she will grow up with a deep sense of pride in her Irish heritage because of the fantastic plaque and the customized print that not only explains the name but gives her a personalized, custom genealogical link with all the names of her direct ancestors. What a wonderful job, quick, efficient and so easy to work with you on the whole thing! From Ireland to America via Australia - you have one very happy grandmother (Marme) and grandfather (Pappy) here that will surely be repeat customers! Bonzer!!!!! Rebecca and Robert M.
my father recieved his crest and flag and I can tell you this ; the pride and happiness in his voice was amazing. daddy told me that yall did a fabulous job and he would remember this always and forever. 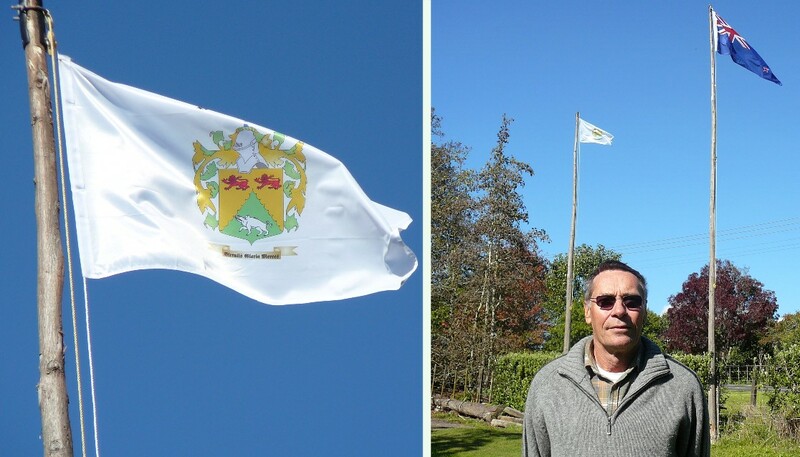 daddy said; to me this morning that it was just beautiful and there are no words that can express the pride that shows in the workmanship of the crest and flag. I will soon be sending yall some pictures of him opening  the package and you can see for yourself how proud daddy is. I myself want to thank all of you for such a wonderful way of making my fathers dream come true and doing such a wonderful job in the workmanship of our family treasure. the flag too was just amazing . I am sure that more orders will come to you from some of the other masonic men for their family treasure as well. thank you again. many prayers sent to all of you and may god bless you all always and forever. 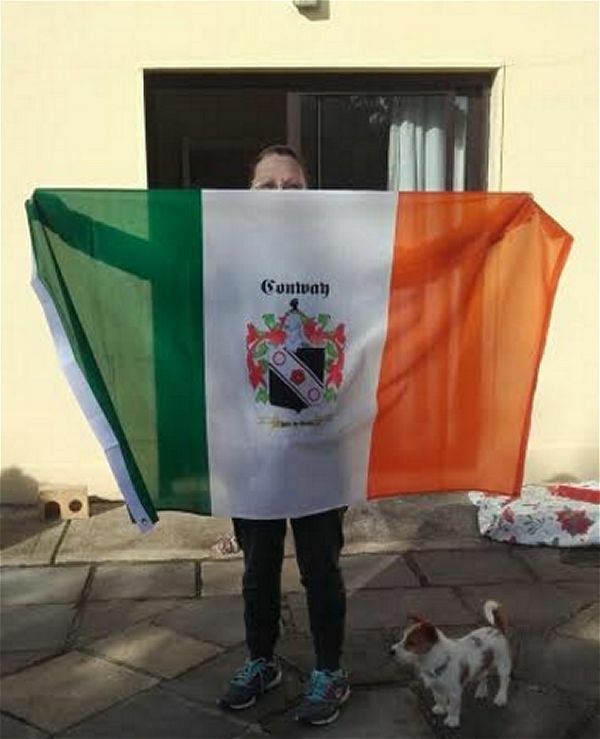 Late yesterday afternoon the post delivered the correct Sweeney Irish crest flag with the grommets !!! It'll go up over our front entrance tomorrow (not today--believe it or not the weather forecast for today includes severe storms and a possibility of a tornado ---no way woould I subject that Irish Nations' flag to that kind of wind after you and I have gone to so much trouble to get one from your shop to our home---only to have it blown away by a tornado--maybe back to Ireland, even, eh? Seriously thanks for your efforts and trouble on this order--you've earned another fan and certainly another customer. Keep your newsletters coming ,  they contain a lot of ideas for future gifts etc. Thanks, Mike for being a trust worthy business man. They seem to be very few these days. mind because that is where most of my ancestors came from. I have visited Ireland and although I love my country, I sometimes long to live in County Down where my great grandmas was born and raised. The plaque arrived and it is perfect ! I presented this wonderful piece of hand-crafted art to my family and my mother began to cry when she saw the names! Yes, it made my mom cry. 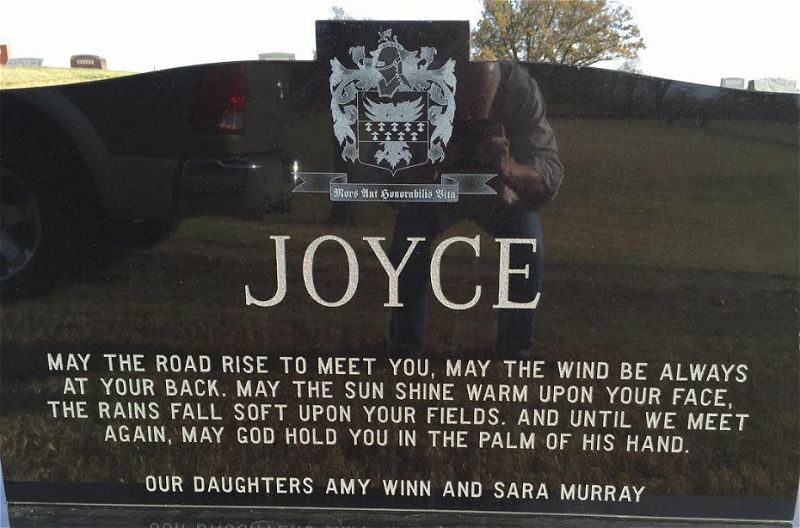 She told me it will be displayed in her home for the rest of her life. It was packaged very well to arrive in perfect condition for such a long journey. I want you to know you have brought happiness to many people today. Please accept my heartfelt thanks, to you and your team. I just wanted to let you know I received the package today with the 6 coat of arms! They are wonderful! Thank you very much for all of your help. My parents will love them. and we are enamored---ABSOLUTELY LOVE! Everything is perfect, authentic and highly detailed!! I just got the cufflinks in the mail!! I love them. I can't wait to give them to my husband for his birthday. They are sure to be a treasured keepsake. Learned  today the "Morrison Coat of Arms" was received in great shape. My brother was deeply touched with its beauty. Your staff should lay their heads on their pillows nightly peacefully knowing they bring contentment and joy to your followers. The presentation from the ol' sod will forever be treasured. Deo Gratius... Please remember me in your prayers. Fair winds...following seas. 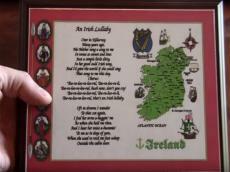 High-Quality Plaque of Your Favourie Irish Song. Looks Great in a home den or in an office! 9 x 7 inch approx, wooden plaque. Durable, hard-wearing surface, resistant to scratches. Fine Quality Irish Music Lyric Plaque looks great in home or office, or as a special gift.